If you’re looking for new Bitcoin casino games to play and new BTC cash prizes, you’re in luck, because two leading Bitcoin casinos have just added some novelties to their offers. Providing you with a chance to enjoy slots from a long-standing European game maker and fresh weekly slot tournaments, Fortune Jack Casino and BetChain can both give you reasons to go online this week and play top casino games. To get more information about these fresh offers, just keep reading. 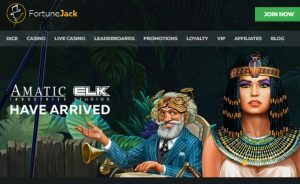 Maintaining its status as a leading Bitcoin casino that never stops improving its platform, Fortune Jack has just added new slot machines and table games from land-based casino veteran Amatic and rising online software provider Elk Studios. That’s around 70 new Bitcoin casino games that you can enjoy at Fortune Jack, apart from the dozens of other great games from the likes of NetEnt, Quickspin, BetSoft, and more. If you haven’t heard about Amatic yet, this Austrian company has been making hit slot machines since 1993, starting first in the land-based casino sector before expanding online. Currently, Amatic is part of the Novomatic group – a gaming company whose logo you can find all over European land-based casinos. Fortune Jack has added more than 40 new games from this traditional studio, including classic slots like Lucky Bells and Hot Star, modern slot machines like Wolf Moon, as well as table games like Roulette and Blackjack. As for Elk Studios’ games, they are around 20 in number and they are mostly slots. This Swedish software maker had started only a few years back, in 2012, but its already making a name thanks to its hit slots like Taco Brothers, Poltava, and the 3-reel classic Ivanhoe, all of which can now be found at the casino. To see exactly what’s been added to the ever-increasing portfolio of this top BTC casino operator, you can pay a visit to Fortune Jack. If you’re a competitive BTC slot player and want to grab free cash rewards for playing top online slots, BetChain Casino has just added a new tournament that can cater to your needs. After the success of its monthly Slot Blitz competition, the casino decided to add a new weekly Spin Fest tournament. And this time there’s a prize pool of $10,000 and 1,000 Free Spins! This incredible prize pool will be given every week and split between 20 different players, with the first, second, and third player on the leaderboard getting a prize of €5,000, €2,000, and €1,000 in BTC equivalent, respectively. The rest of the leaderboard is reserved for cash prizes that vary between €700 and €50 as well as free spins rewards of 35-200 free spins. The best part of the promo is that all you have to do to get yourself one of these prizes is to be a member of BetChain casino and play any of its available slot games. Yes, you’ve heard that right, any game is applicable. The current leg of the competition ends in 14 hours, but if you want to get a head start for the next one, you can go to BetChain and take a look at the rules and prize board.